And he has only mostly HIMSELF to blame…. A New York City Real Estate guy who fell into the American Presidency ill prepared now wrestles with political alligators…. He will deliver a State of Union Address this Tuesday after Hours Speaker Nancy Pelosi, a Democrat allowed him to show up….It’s been like that…. 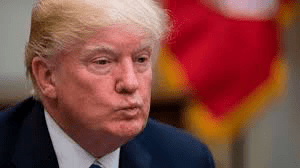 His 2nd Government Shutdown close on the horizon possibly if he can’t figure out a way to deal with the fact that he WILL NOT be getting BILLIONS for a concrete/steel wall…. He’s ignoring his own Intelligence Community on world problems…. His Defense Dept. is against his military moves in the Middle East…. He hasn’t signed off on ANY of his early trade ‘deal’s with China, Europe, Canada or Mexico’…. His poll numbers are inching downward …. I could go on with more problems the guy has…. The challenges mount at a moment when Trump is as unencumbered and isolated as ever. Inside the White House, aides describe a chaotic, freewheeling atmosphere reminiscent of the early weeks of Trump’s presidency…..